This day finally came. Time flies soon, we were already at the end of the second week in Cambridge here unwittingly. Tonight we had a wonderful farewell dinner at Pepys Cloisters of Magdalene College in Cambridge. Perhaps in celebration for the hard work in the past two weeks, participants including students and teachers all wore a big happy smile on their faces. More importantly, the most attractive thing that must highlight was the warm atmosphere among people. The well-dressed ladies and gentlemen all behaved properly and politely. Unlike the first day on the welcome reception, we harvested more friends and got more familiar with each other. After even such a short period of staying with each other, we all made some solid friendship here regardless of nationalities and cultures. I believed that such cross-border friendship would also last long, which was very meaningful as well. One the most exciting and impressive moments for me was receiving the grading report of examinations. These reflected our overall academic performance on the very subjects. I understood that the exact grades may only account for one of the important evaluation of the effectiveness of our efforts in school work. There were more knowledge of the subjects for me to further explore. 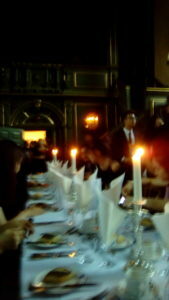 Finally, it was so cheerful of us that we could enjoy the farewell dinner in the glorious spacious dining room. There were three main western dishes available during the dinner. We had chicken, vegetables, sweet potatoes, pastries, puddings and so on. They all tasted very good. In the mid of the dinner, the dean of the summer institute here addressed a brief speech. She showed great gratitude towards all the students and appreciation to the student helpers as well. Meanwhile, she had a good wish to every one of us in the future. In a word, this farewell dinner was so good. Everyone was grateful for the moments they had spent here. And I do wish I could do better for the next period!